Just five days after finishing my last ever college final, my best friend Grace and I buckled our seatbelts for a trip to Denver, Colorado. 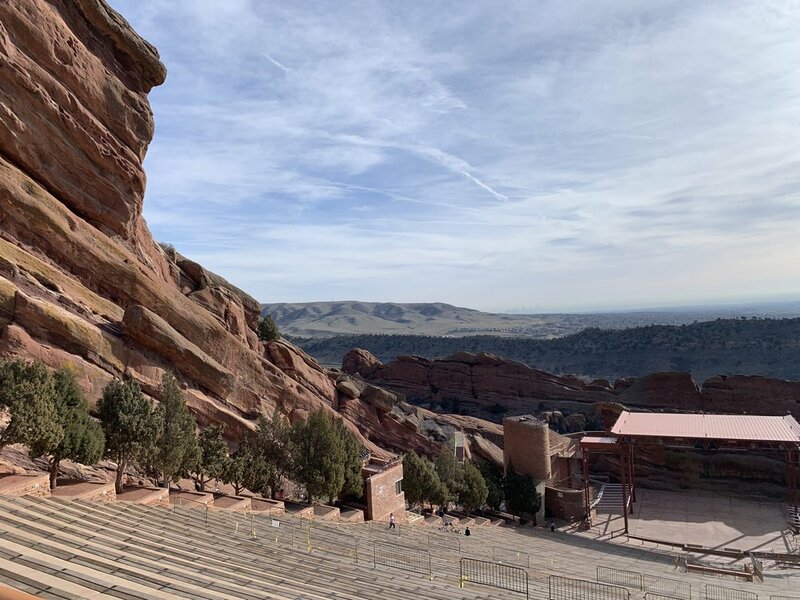 Our play-it-by-ear four-day itinerary took us into the bustling and developing downtown Denver, through the beautiful town of Boulder, and up to the breathtaking peak of Red Rocks Amphitheater. An early departure meant a brunch-time arrival, so we headed straight for Snooze A.M. Eatery in Union Station. I lugged my body-bag - oops! I mean suitcase! - through the restaurant to its outdoor patio, perched along _______ street. First things came first: mimosas. Next: food. Should we split something? I don’t know why I ask, because the answer is always an easy yes. As easy as the yes to mimosas. Our favorites caught our eyes immediately - a double-avocado whole-grain toast and a sweet potato and veggie hash, both with fried eggs. Though we weren’t our most adventurous selves with this order (if only you knew how fundamental avocado, whole-grain bread, eggs, and sweet potatoes are to my diet), it exceeded my expectations and satisfied all my brunch cravings. I like to think Denver welcomed us with some of the first rays of sunshine all year. To soak it up and stretch our legs, we strolled through Washington Park in the afternoon and could have sworn it was a Saturday rather than a Wednesday, given how many dogs ran to catch frisbees their people threw for them, how many picnic blankets lay beneath spring-time snacks and beverages, and how many strollers wheeled tiny humans in adorable sunglasses. We caught wind of a rooftop bar (one of many) that overlooks downtown Denver - Linger. The view, the music, and the people quickly convinced us we chose a cool spot. The rose, the sweet potato fries, and the charred edamame still linger in my memory (pun-intended). It’s a place for both the younger and older crowds, but not those who may have a fear of heights - more so for those wanting some affordable, but still tasty food and beverages paired with a stunning view of the city. If there’s one thing I can’t get over about Denver, it’s the Red Rocks Amphitheatre. This place took my breath away, figuratively and literally. I mean, looook at that stunning view. Of course, being the young and active individuals we are, Grace and I just had to get a workout in. We tried to run the stairs, but were stopped by the unusually long distance between each step, so we resorted to a bodyweight HIIT workout instead. At roughly 6,400 feet altitude, my breath was almost literally taken away, but in the best way possible! Nutritional replenishment brought to us by RX Bar (not sponsored). Not far from our Air BnB was Larimer Square with its cute little string lights and bustling downtown strip of restaurants, coffee shops, business, and more. We strolled (and grumbled about how nobody in busy cities knows how to politely merge on the sidewalk when walking by) the streets, picked up some lattes from Caribou Coffee, and then grabbed a couple salads from a little grab-n-go type of place of which I cannot remember the name. If we’d had more time and energy, maybe we would have strolled and shopped a little more. All we wanted was to walk, sip on a latte, look around, and enjoy the sunshine - you know, the sunshine we brought from California. On this night - March 28th, 2019 - I discovered my favorite food. Or maybe it discovered me. Pizza had always been like that guy who is just so interested and determined in chasing after a girl (me in this scenario), but she has been indecisive and unable to commit… until now. She realized that the simplicity of an authentic Italian dough delicately topped with a homemade red sauce and just a modest (because modest is hottest) handful of quality mozzarella cheese was all that she wanted in a meal, and quickly - one or two bites in to the best Italian pie to cross my lips - she fell in love. Committed to pizza, and only the very best. Avanti F & B is the place to go for an affordable happy hour with a selection of wines, beers, and cocktails, and the best pizza I’ve ever had. A short 30-40 minute drive North took us to downtown Boulder the next day. 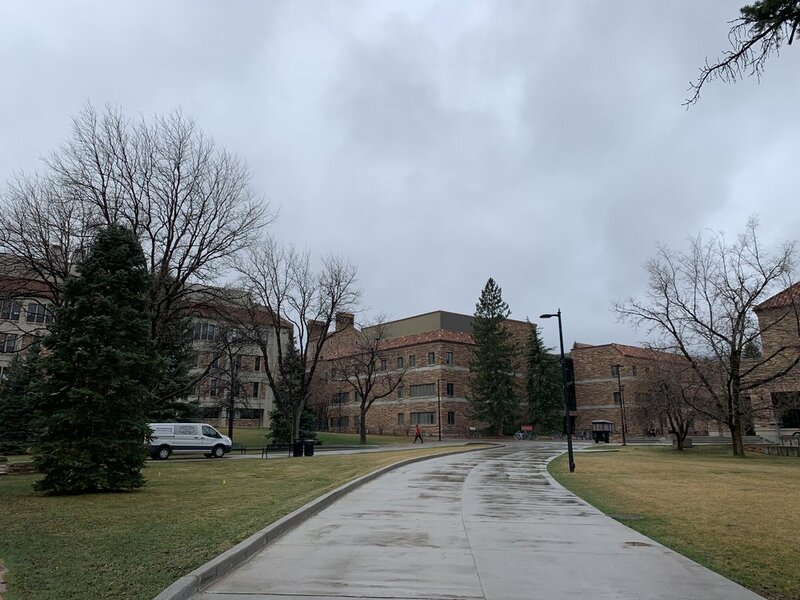 Despite a light sprinkling of rain, we walked the strip of coffee shops, boutiques, restaurants, and outdoor gear stores before driving over to see CU Boulder. It’s a beautiful campus - brick buildings, picture-perfect mountain view, and a stunning athletics field. But, not long after, hunger struck. 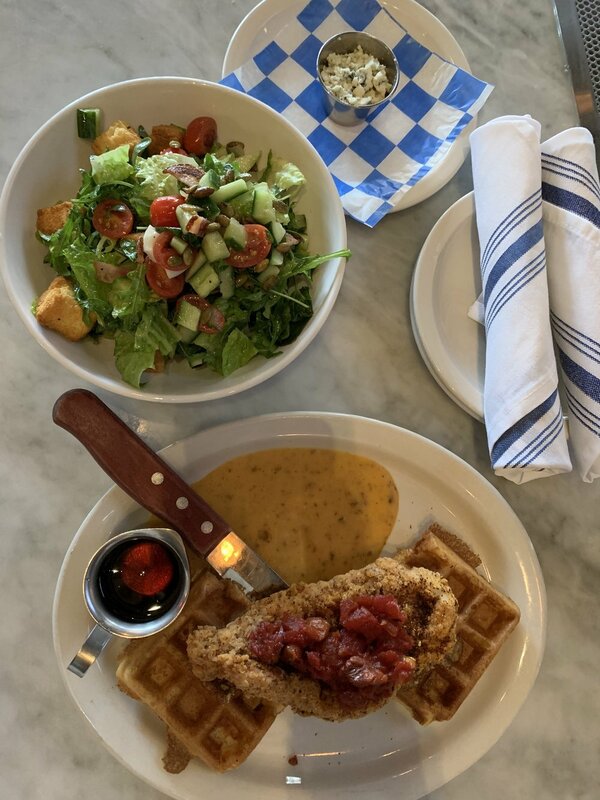 Back in downtown Boulder, we spotted The Post Brewing Co. and took a seat at the bar to split a salad and our first ever plate of fried chicken and waffles. Fried chicken and waffles! Fried. Chicken. And. Waffles. Pizza still has my heart, but if anything ever changes… fried chicken and waffles. Like water after a sweaty workout, we needed something sweet and substantial after lighter-than-expected lunch. Just a couple blocks from our Air Bnb, we found the Happy Bakeshop. I gazed at the adorable, fluffy little cupcakes, resisting the urge to lick the mesmerizing swirl of frosting off the top, and instead went with a scotcharoo. Grace picked some sort of cookie bar with just about every add-in imaginable: coconut, chocolate chips, cereal, peanut butter, oats, and more. If you’re in need of a sweet treat local to the Highland area, look no further. Almost everyone we chatted with recommended we visit RiNo Art District for plenty of good food and lively breweries and bars, so we penciled that in for our Friday night. This place, I imagine, would be as cool as everyone made it seem if it weren’t pouring rain - that way, we could have walked around and explored multiple places over the span of the few blocks it covers. Still, we made the best of it at 10 Barrel Brewing with a couple ciders, a plate of baba ganoush, and a phenomenal falafel burger and sweet potato fries. What would you say if I told you that I’d never eaten a chocolate croissant until now? A cafe-baker for 6 months, home-baker for 6 years, and I’d never thought breaking open a warm, flaky, chocolate-stuffed pastry could be so satisfying until I did exactly that at Allegro Coffee in Denver (our second choice when we ran into a 45-minute wait at Denver Biscuit Co.). Let it be known, far and wide, that I love chocolate croissants. Maybe I’ll attempt one, or maybe - as I do with quality, fresh-baked whole-grain bread - I’ll leave it to the expert bakers. PS don’t mind the breakfast burrito sitting beside the croissant, and excuse my harsh review here, but that burrito was far from… well, good. We finished off our last day at the Stanley Marketplace with Emilie from Emilie Eats, peeking into little boutiques and restaurants and chatting about all things blogging, school, nutrition, and more. Sometimes I still find it hard to believe that I’ve made such strong friendships via Instagram! 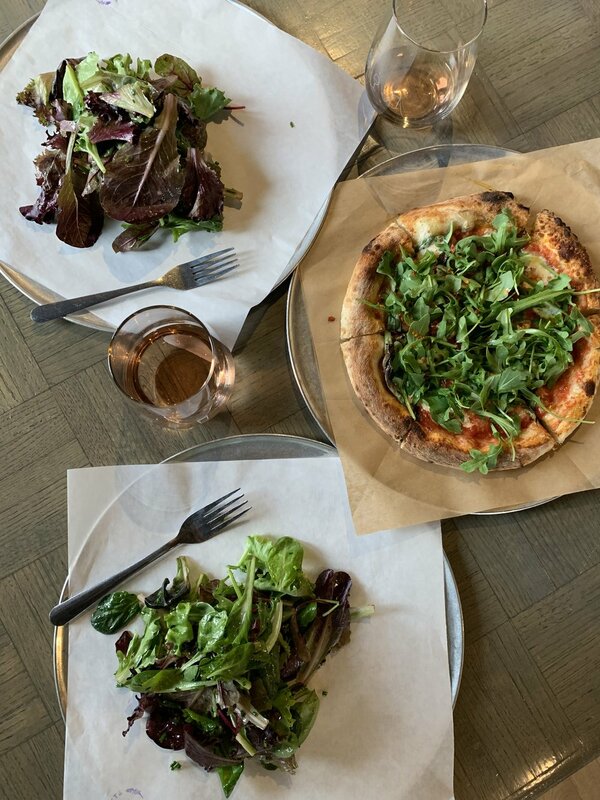 For dinner, we chose Bar Dough in Denver because now I’m just smitten over authentic Italian-style pizza and will take almost any opportunity to eat it. Ours was the mouth-watering Il Grande - absolutely delicious. And that concludes my first trip to Denver! I had no intentions of “working” during my trip (except for a few emails here and there), so what you read about here was my itinerary. Had my trip been a few days longer, you can bet your bottom dollar I’d have visited Denver Biscuit Co., VooDoo Doughnuts, and maybe even Bar Dough one or two or three more times. 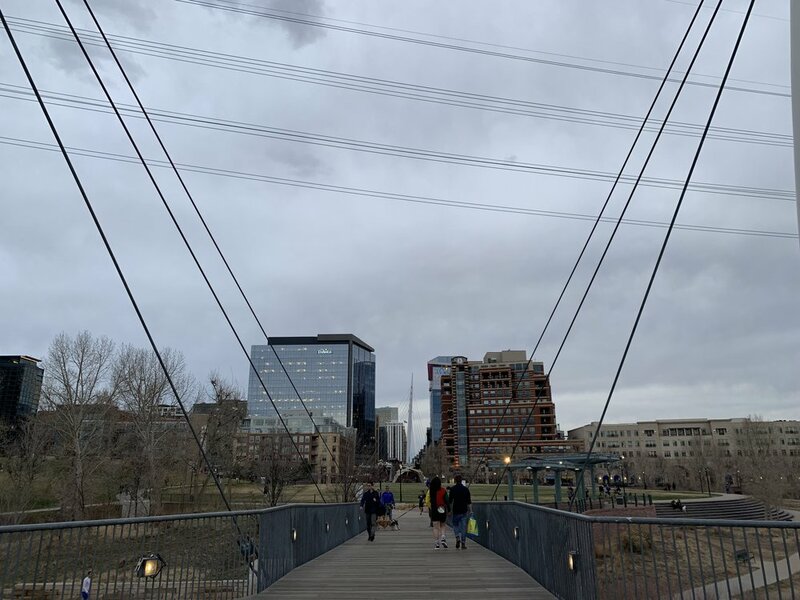 Other recommendations I received but wasn’t able to fulfill were Chatauqua Park, Denver Milk Market, Pearl Street Pedestrian Mall, Park Burger, Little Man Ice Cream, and Root Down. Thanks for feasting your eyes on my words, eats, and travels. I hope you enjoyed, and I hope you get the chance to see Denver and the surrounding beauty that is Colorado at some point. Ta ta for now! It’s no surprise I love to bake. And if it is a surprise to you, well, it must be your first time here, so welcome! Anyway, I love to bake, but the thought of baking bread kinda’-sorta’-really terrifies me. I’ve tried once before, and instead of a beautiful, fluffy, golden brown loaf, I think I pulled a football made from flour out of my oven. I haven’t tried anymore homemade bread since then. Bread is one thing I’ll leave to the experts, like the bakers of California Lavash. This family of bread-makers, located in the town of Gilroy in Central California, uses traditional baking methods and simple ingredients to produce whole-grain lavash, naan, and pita the way their family has done so for years. All ingredients are vegan, non-GMO, and free of artificial preservatives. If you didn’t already know, I’m kind of a nerd when it comes to nutrition, so you can bet I check the ingredient list on most packaged foods when I’m grocery shopping. Several store-bought breads are made with whole-grain flour (one of the first ingredients on the list, where it should be! ), but several of those also contain different modified versions of sugars, gums, and other preservatives to keep them on the shelves for longer periods of time. These won’t kill you (at least I think they won’t? ), but it’s best to consume as few of these as possible and as many whole foods/ingredients as possible, don’t you think? I’m not exaggerating when I say I was amazed when I looked at the ingredient list on the California Lavash package - just whole-wheat and wheat flour, water, oat fiber, yeast, oil, and cultured yeast. Each of those ingredients serves to produce the flavor and structure of this flatbread, and because the grains are in their whole form, the ingredients also serve nutritional benefit. Win, win. Lavash is a bit different from other breads - it doesn’t boast many air bubbles and isn’t shaped in a loaf form. Instead, it’s… well, flat, as the name “flatbread” implies. I’m a firm believer in fluffy, yeast-risen bread, but lavash deserves some love, too. Though it doesn’t rise, it still comes out of the oven light and airy and yields itself to several possibilities for both the creative cook and the quick-and-easy eater. Keep it as is fresh out of the package for a veggie-packed wrap with hummus, or bake it with your favorite sauce and toppings for a twist on thin-crust pizza. Slice it into smaller squares and bake those into chips (sweet or savory!) or taco shells. Because it’s free of preservatives, the flatbread is best stored in the fridge for immediate use, and in the freezer for longer-term storage. Click here to visit the website, and select “store locator” to find them near you, and stay tuned for a lavash-chip recipe coming later this week! Welcome to San Luis Obispo! It's time for breakfast, so we're going to skip the small talk and get right to it. This cafe was one of the very first I tried in SLO when I moved here for college. My mom and I shared two of the scones - if you could get me to eat and enjoy a scone during that rigid-eating time in my life, you were doing something right. Sally Loo's, you got it right. Walking into this space feels like walking into both a home and a restaurant at the same time. Pick up a menu for the items always served, but don't miss the specials board - that's where you'll find some of the most delectable dishes in town. If the definition for hand-crafted could be told through food, it would be a Sally Loo's special. I ordered the Big Al's Avo Toast special this time, after much contemplation over that versus a burrito, and now I know - if I'm ever stuck between a special here and a regular menu item, I should probably go with the special because 1) it's only offered for a limited time and 2) DANG it's good. The avocado toast was piled high with... well, avocado - there will be no skimping on this creamy favorite toast-topper. And because I was in a treat-myself/why-not mindset, I added the optional smoked salmon on the side. I'm still here actually, at Sally Loo's typing this up (because this is a study-friendly spot!) and I'm tempted to never leave, so that I can order something for lunch later and keep absorbing the light-hearted, community-centered atmosphere. It's one of a kind here and you will regret absolutely nothing about coming here and ordering anything on the menu. If you aren't in the mood for avocado toast or come when the specials menu has changed, my other recommendations include the Breakfast burrito (veggie for me), the San Louie Bagel, and anything from the bakery case - it's all made in house! And don't forget to grab some coffee, too, while you watch the barista craft your drink. It's just cool to watch, and the drinks here beat those at some of the other coffee shops in town (that good!). My first thought when walking into Louisa's: "my dad would love it here." And he does! During my freshman year, I brought my parents here for breakfast, not knowing at the time that it was voted one of the best breakfast spots in all of SLO county. To this day (three years later) I hear locals talk about Louisa's with more genuine adoration than many restaurants I've visited. Each weekend, when I'm outside walking or riding my bike during the quiet mornings, I see locals perched inside Louisa's at the counter reading the paper, sipping some coffee, and digging their fork into omelettes and pancakes and breakfast burritos I can smell from outside. And then I drool. We ordered omelettes - Vegetable Medley for me and Guacamole & Bacon for my friend. Of course, we both chose the homemade biscuits (did you hear that? homemade biscuits) on the side and could not stop talking about them alllllllll day. The omelettes were large, but large and delicious! Omelettes are a breakfast dish I always appreciate because I just can't make them well enough at home, and Louisa's made them beyond well enough to convince me that I don't need to learn how to make them - I'll just head down to Louisa's when the craving hits. And as for the homemade biscuit... it is a must. An absolute must. This is a spot I would take my dad. Diners are his favorite - those people I see when I pass by on weekend mornings would be my dad everyday at Louisa's Place if he lived nearby. The portions are big, so come hungry, with friends, and/or ready to bring home leftovers. Don't expect green juices and refined-sugar-free paleo breakfast pastries here - come for home-cooked meals made with real food and served in an atmosphere that feels like a home away from home. This is a relatively new spot in downtown SLO, quaintly nestled in between between a couple of my favorite stores on Monterey Street. Since the day it opened, it's been calling my name and drawing in several other customers, too. Mint + Craft screams downtown SLO... in a really good way. If you're feeling like a light, vegetable-forward breakfast Mint + Craft is your spot! Grace and I spontaneously chose this for breakfast one day and could not wait to get our hands on some toast, which seems to be the focus of their breakfast menu. And, like, I'm cool with that. We walked in and ordered at the counter immediately, but if we hadn't been so hungry, we probably would've spent some time browsing the shelves stocked with anything and everything that could distract me (again, in a really good way) - from cookbooks to homemade jams and jellies to cute linens to artisan chocolates. Oh, and if you aren't looking to sit down and eat, you can head over to the refrigerated section for packaged wraps and salads, bottles of juice and kombucha and even wine and beer! Or, grab something sweet from the bakery case - might I suggest the lemon bars or caramel brownies or giant chocolate chip cookies? Anyway, onto our breakfast - The Obispo for Grace and The SLO Market for me! We ordered and chose a table outside, and our food came in under five minutes, which was good on their end because, my goodness, were we hungry. First things first - the flavors. So many of them, and they all worked together to make an incredibly tasty and unique slice of toast. Grace certainly enjoyed hers, too. She's picky about her bacon and wants it exxxxtra crispy, and they delivered to her liking. We recommend both! One more thing - Grace ordered a cup of coffee, for which they offer free refills, and she grabbed another cup to go because it was so darn delicious. It's time to introduce you to a favorite since my year in college here - Big Sky Cafe in downtown SLO. Most of my meals here have been for lunch or dinner, with the occasional happy hour/appetizer hangout with friends, so after looking at their breakfast menu and holding their food and service in high regards, I knew this was a must. We spent a fair amount of time reading through the menu because everything - e v e r y t h i n g - sounds good. Eventually, I went with the Greek Spinach, Feta, Mushroom & Tomato Omelette. Oh my word. It was unbelievable. Served with breakfast potatoes and sauteed peppers and onions, this plate filled me to the brim, so I was glad I came extra hungry, especially for the complimentary basket of cornbread as an appetizer (ask for some to-go!). Big Sky Cafe doesn't skimp on anything. Flavors are abundant, freshness is impossible to miss, and seasonal, local produce are a main component of each dish, so they're clearly speaking my language here. This is a place I can bring anyone - when Mom and Dad come into town, we come here for drinks and a food we know will be delicious and service that welcomes them into town. When my friends and I can't decide where to eat, Big Sky offers a variety of options to satisfy each of our cravings - whole-grain pancakes or shakshuka, omelette or beignets, breakfast burrito or crab cakes benedict. And last but most certainly not least, take this recommendation as encouragement to treat yo'self. Lido at Dolphin Bay (yes, I brought Grace again because she is my partner in all things, especially eating, if you haven't noticed) is everything I want for brunch and then some more. We have a friend who works here and suggested we come in, and he definitely knows what she and I like when it comes to food - most importantly brunch - so we trust him. A Sunday morning at Lido is a stunning view of the ocean + friendly, welcoming service that makes you feel like royalty + food that might very well be my ideal definition of brunch - and by that I mean kinda' healthy, kinda' not, and completely whole-platedly delightful. Grace and I ordered two plates and split each one - eggs scrambled with spinach and white cheddar and served with sweet potato fries (which we asked for instead of the home fries) and a half-order of the thickest, fluffiest French toast I've ever tasted. Bottomless mimosas were most certainly involved here, too. Duh. We left feeling like princesses more happily satisfied than we can ever remember, and not just because of the mimosas. I will, without a single doubt, be back to Lido for more. Like I said before, it's a place treat-yourself-kind-of-place, so plan accordingly. Most importantly, enjoy every minute and every bite because this is a special restaurant with unmatched service, unbeatable food, and a breath-taking view. And that's a wrap (or should I said breakfast burrito? or should I not because maybe that would have been a weird joke?) for my favorite breakfast spots in SLO! As you may have noticed, I prioritize restaurants and cafes that emphasize local food and community, and offer some nutritious options as well as some... well, some other more (let's just say) "fun" foods. I hope you have the chance to try each of these places, and when you do, tell them Haley sent you :) happy eating! I first connected with Central Coast Meats over Instagram when they filmed a behind-the-scenes cooking demo of one of the best looking burgers I've ever laid my hungry eyes on at one of the best local cafes here in SLO. Naturally, I just had to check their page out, but I didn't find what I expected to find. Rather than a handful of other juicy burgers, I saw people I just knew I could trust. People I wanted to barbecue with and hang out with and get to know because the transparency allowed me that opportunity. When I sat down to talk with Kyle, one of the company's founders, he emphasized that transparency is one of the key areas where Central Coast Meats saw a potential for improvement within the industry and is now utilizing that necessity to set an example for other farms. All the middle-men between the farmer/producer and you and me, the consumers, make transparency a little difficult these days. Central Coast Meats values transparency in every step of the process - from their pasture to your porch. These guys care about every step of the process and, most of all, us as consumers. After years of watching the farming methods of generations before them, they courageously and confidently stepped aside to pave their own path, one that cares for the animal from start to finish + prioritizes the consumers' health + supports both the local and large-scale environments. Because, like almost any other locally grown food, locally grown meat travels fewer miles to get to your doorstep (literally - CCM delivers! ), thus eliminating the need for further preservation methods and guaranteeing a higher quality, fresher product. Because they clearly define what grass-fed means - their animals have more acres on which to roam and feed than my eyes can see in distance. And none of that food is processed with hormones, antibiotics, corn, GMO- or soy-containing feeds. This is a subscription-based monthly delivery sent directly to your doorstep, so head over to their website to give it a try and then subscribe if you like what you taste. I value local companies and feel so blessed to be surrounded by a community of farmers who all value nutrition and real food, and transparency and customer satisfaction. Central Coast Meats absolutely stands out not only here in San Luis Obispo, but throughout the country and I cannot - repeat: cannot - wait to keep showing them off to you guys because what they've got going here is exactly what the industry needs. Stay tuned for recipes to come! Nut butter. It's one of those phrases I just love to say, mostly because it tends to bring about a sense of discomfort in some when repeated over and over, especially when paired with "uggghhhhh I LOVE nut butter!" (and don't even get me started on "nut milk" and "nut cheese"). ... they make me happy when skies are gray (skies are currently very gray). They make me happy when skies are blue, too, though. Heck, the sky could even be a fiery orange or deep purple and, as long as I've got a jar of nut butter in hand, all is well to me. My latest obsession: NuttZo Nut Butters. Sorry - excuse my sassiness. NuttZo is a redefined version of nut butters. It's not just almonds or peanuts. NuttZo has tapped the shoulder of my inner forgetful self and added in nuts and seeds with all the nutrients my body needs most: chia seeds, flax seeds, brazil nuts, pumpkin seeds, hazelnuts, and more. 1) One of the most unique, delicious nut butters I've ever had. 2) The first I'll reach for in the nut butter aisle at the grocery store (this is saying A LOT). 3) Absolutely worth every penny (I'll explain more below). Because, if you're anything like me (busy, on-the-go, health-minded, nut-butter-loving), NuttZo speaks directly to you by combining all those essential, otherwise hard-to-find nutrients into a simple, delicious, complete-protein nut butter - peanut, almond, or chocolate! On their own, nuts and seeds are incomplete proteins, but when combined (whether in one meal or within a short period of time), become complete proteins for our bodies to more easily access and utilize. Need another reason to buy? Each purchase supports Project Left Behind - a non-profit that aims to "promote education, improved nutrition, and living conditions for orphans and neglected children around the world." Need I say more? Find NuttZo at most health food grocery stores, some Costco locations, and online via their own website, Thrive Market (my favorite), and Amazon Marketplace. Thank you for reading and enduring all my talk about how much I absolutely adore nut butter, especially the way NuttZo crafts it. As always, if you enjoyed this post, keep coming back for more! Leave a comment below with your suggestion for my next post, whether it be a recipe, workout, nutrition tip, or product review.